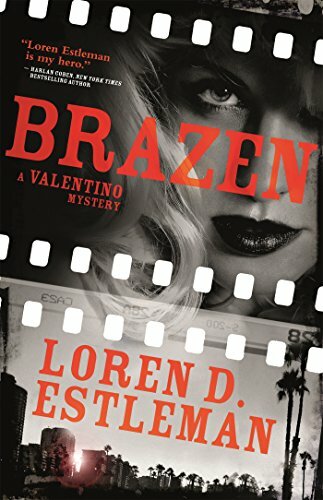 That tribute concludes Loren D. Estleman’s novel but the blondes in the story preceding that accolade would disagree; each of them is murdered in a style copying exactly the death of a famous “blonde bombshell” from Hollywood’s glorious and not-so-glorious past. When the body of retired actress and fellow movie memorabilia collector Beata Limerick is discovered in her home, UCLA film archivest Valentino recognizes the scene as very closely resembling that of Marilyn Monroe’s deathbed . . . too closely for comfort, especially since only a few days before Beata confided in him the reason she quit show business was to avoid the “Blonde Curse,” namely that any blonde succeeding in Tinsel Town would die young and violently. She followed up her argument by citing the deaths of Monroe, Thelma Todd, Sharon Tate, and Jayne Mansfield, among others, while proudly displaying her latest find, the wig worn by Mansfield when she died in a horrific auto accident. Investigating detective Ray Padilla, having crossed verbal swords with Val before, immediately marks him as Suspect Number One, since he and the deceased were close, though not in the way Padilla hints. Val’s soon cleared and becomes his usual thorn-in-the-side to the detective, who’d rather handle the case by himself, thank you very much, without the help of some buttinski cinema archivest who probably knows Hollywood better than the LAPD. When the second death occurs, mimicking Thelma Todd’s demise, Padilla’s a little more inclined to see parallels instead of coincidence, but the murders are far from over. Using the skills he employs in discovering lost films to restore and preserve, Valentino digs into the case, occasionally sidetracked from his investigations by preparations for his best friend’s wedding, and his financial concerns for The Oracle, the abandoned movie house he’s struggling to restore, whose projectionist’s booth is his current place of residence. Those are merely pleasant, if somewhat expensive, little interludes in a quest to prevent the deaths of as yet unknown blondes, whether their hair color is real or enhanced. Then the killer’s plan takes a wrong turn, or perhaps merely a detour . . . or does it? Victim number three is male, and a brunette, but . . . Geoffrey Root’s a female impersonator, and a good many of his roles are of certain famous blondes. That makes him fit the bill . . . sort of . . . unfortunately for him. Now Padilla has a genuine suspect but Val isn’t so certain. Some things fall into place exactly, while others just don’t add up. Valentino’s seen enough mysteries to know how the theatrical serial killer mind works. Will a real killer’s thought processes follow the same script? Brazen is definitely a film-lover’s story, filled with numerous theater contrivances. Indeed, it’s surprising the author didn’t work in some reference to “the Scottish play,” to make the murderous analogy complete. Though death abounds, there’s no violence on-scene. Like the Greek tragedies, any fatalities take place off-stage, reported by Lt. Padilla as the chorus of relentless justice. Any film buff worth his salt will immediately recognize the clue giving them the killer’s identity, and probably follow it with an eager “Aha!” of triumph. The quips and bon mots exchanged by Val and crew, with Padilla sometimes as the foil, but more times than not directed at Valentino himself, are extremely reminiscent of scenes from any of The Thin Man movies: sharp, sly, and witty. If there’s any complaint to the story, it’s that the ending is too quick, so blink-of-the-eye fast the reader may have to backtrack to realize the story’s over, with the entire wrap-up consisting of a bare page or two. Each book section features the title of a famous “blonde” movie. For the enthusiast, the author also includes a bibliography of sources used in the writing of Brazen, as well as a filmography of the movies of the screen’s greatest blondes. His synopses of each should encourage the interested to seek them out and read, or view, more. All in all, Brazen is an entertaining mystery for filmgoer and non-movie lover alike. The characters are likable and amusing, with tongue-in-cheek impudence. The story features snappy dialogue, the lure of a serial killer, and the lore of the great, and not so great, movies of the past. With a combination like that, it should have definite interest for the mystery reader. This novel is the fifth in the Valentino series; if the others are as entertaining as this one, it’s no wonder they have so much appeal.